Civil Service Local has been supporting vulnerable members of society since March 2014. 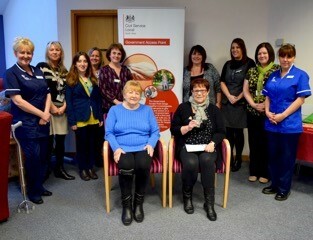 The Government Access Point project (GAP) attends hospices in the North West to provide access to Civil Service information from departments including DWP, HMRC, Land Registry, Home Office and Ministry of Defence. The project initially started with two hospices St Catherine’s in Preston and Trinity in Blackpool. We are delighted to more recently work with a further two hospices, Brian House and Woodlands in Liverpool. GAP provides a friendly face to face advice service giving practical information and joined up advice on any Civil Service enquiry, providing support for our vulnerable citizens in an environment they feel comfortable in. We support patients, family members and friends at a difficult time in their lives. All the feedback we have received has been very positive and many who we have spoken to did not know this support was available to them. Confirming that it has made a real difference to people in the community at a time when they need it most. 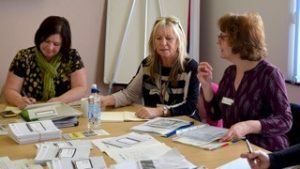 Kathie Bates - "It is inspiring to see‎ four years on how our pilot with Trinity Hospice has grown into a key part of Trinity's support and advice service. It is always a privilege to meet the patients and staff at this amazing organisation and I’m so very proud of our volunteers." CS Local have been coming to the Day Therapy Unit at Trinity Hospice since 2014. During this time a great working/unique relationship has been formed between our two very different working environments. Andrew Crich and Gemma Cooper are very committed to the GAP project, and together with their team, join our group every 16 wks. They are introduced to the groups, mix and gain the confidence of our poorly, but also vulnerable patients. The patients that attend Day Therapy Unit are a mixture of ages and illnesses, but they do all have one thing in common. They are all coming to the end of what has often been a long difficult journey. These patients are starting to deteriorate, and at times become anxious and agitated, low mood and fatigued. One of the main causes of our patient’s anxiety is often their lack of money. Financial stress has a terrible effect on the patients and their families. Most of our patients are not aware of all the benefits that are available to them, and are often of the mind-set they haven’t got the energy to make that call. Gemma and the team sit down with our patients and make this daunting process accessible. Often this process makes life so much easier for the patient and often money can be found that has not been claimed. This leaves our patients with a financial peace of mind, which also aids quality and dignity as they approach end of life. The patients leave with positive views and faith in the Civil Service. I have to admire the way Gemma and the team work with our patients in what can be a difficult emotional environment. They show great respect and understanding, and the work they do here is hugely valued, the project is something we all feel very proud to be part of.